At a time when 73 percent of Americans surveyed tell the Pew Research Center they trust government “only some of the time,” a narrative we developed with grantees of the Ford Foundation convinced seven out of 10 people to support an active government role in helping families escape poverty and achieve financial security. As it turns out, you can persuade skeptical Americans to support government action to address social problems—if you tell the right story. But your narrative can’t be all about government. You have to put people in the picture first, and present them in ways that encourage empathy and respect. 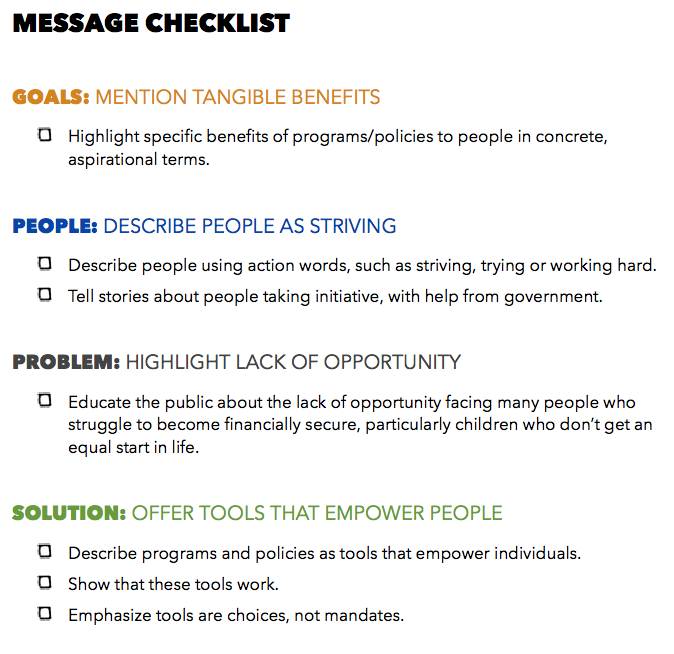 When describing the people who benefit from anti-poverty programs, experts often use words that label people by demographic categories, such as “poor” or “low-income.” Other common labels describe people as “vulnerable” or “marginalized.” If you start a conversation about helping people by describing them with negative labels, you actually make your job harder. That’s because the first words you use to describe a person trigger a chain of reactions that psychologists refer to as “associations.” Unfortunately, nearly 6 out of 10 Americans associate the word “poor” with “lazy,” according to the World Values Survey. Many go on to assume the “poor” aren’t trying to help themselves. Research we conducted to develop the anti-poverty narrative confirmed this. To support government help in fighting poverty, our audience needed to see that people served by anti-poverty programs were working hard to get ahead. Stories of people taking initiative to improve their lives, with help from government, inspired respect for them—and greater support for government action. This research didn’t just offer insights for effectively communicating about people. It also uncovered ways to talk about the problem of poverty in ways that Americans would relate to—and solutions they would embrace. When we put these building blocks together to form a narrative, support rose above 70 percent for an active government role in fighting poverty. A Message Memo and other resources explaining this narrative are being shared with grantees, government leaders and others who shape the national dialogue about poverty. You can apply these lessons to a wide variety of issues—and perhaps change the way Americans think about the government’s role in your cause. Alfred Ironside is director of communications, Ford Foundation; Doug Hattaway is president, and Tess Hart, is an associate, Hattaway Communications. They, along with Wendy Yaross, senior vice president of research, Hattaway Communications, are appearing on the panel: A Poverty of Language: How to Change the Dialogue about Economic Inequality in America at the Communications Network Fall Conference in New Orleans, Oct. 2-4.